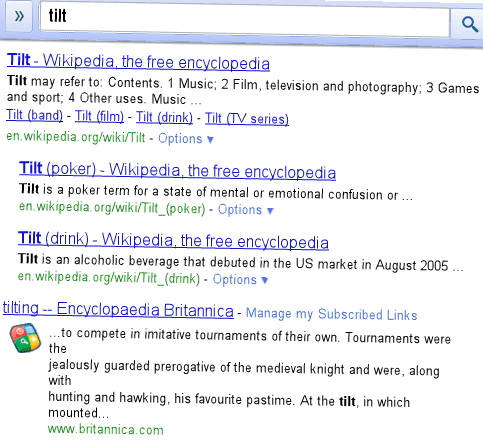 If you search for [tilt], [tilted] or [askew] on a smartphone using Google, you might notice a strange special effect: Google's search results page is tilted to the right. It's an Easter Egg, just like the "did you mean" link displayed when you search for [recursion]. Love it! I'm wondering if Bing will copy this search result too! ...but only in Chrome, it seems. Doesn't work in FF. Google [anagramm] in the German interface (go to google.de or google.com/de) and you get "Meinten Sie: mama rang"
In other languages, googling [anagram] in the English and Dutch interfaces (google.nl, google.be/nl or google.com/en) give "Did you mean: nag a ram" (en) and "Bedoelde u: ma graan" (nl) respectively. Googling anagramma in Italian beckons: "arma magna"
Googling anagrama in Spanish beckons: "gama rana"
They probably ran a program for every language.